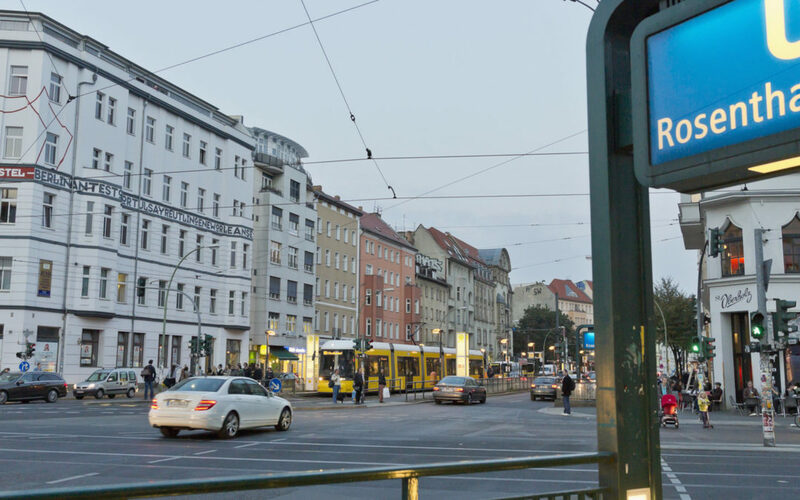 Rosenthaler Platz in Berlin is a busy hub to the northeast of the city centre. The last time I sat on the U-Bahn here, the train slowed down and then passed through a creepy, dimly-lit and empty station with only East German border guards on the platform. It was the summer of 1989, just three months before the wall came down. Rosenthaler Platz was what was called a “ghost station”. The underground was constructed before the wall went up in 1962 and this was one of the stations which was boarded up when the city was divided. The trains from West Berlin passed through East Berlin, weaving right through the middle of the city, only to re-emerge back into the West and literally into the light. Today it is buzzing with foreign students, start-ups and cafes that have turned themselves into communal workspaces. In fact, the one I am in, Oberholz provides a vision of what much of work life in the future may be like: semi-autonomous, creative teams working together on a project by project basis, hiring space in a cafe for a limited time rather than being full-time employees with full-time tenancy in a fixed office. Right now this is still only a small minority of workers but it could become the norm. Berlin is one of those very few capital cities that is poorer than the rest of the country. Most capital cities, such as Dublin, London or Paris, dominate their economy and generate a disproportionate amount of tax revenue, job opportunities and national income. People migrate to the capital to seek their fortune, enhance their chances and get on. This is not the case for Berlin. Berlin is considerably poorer than other major German cities such as Munich, Frankfurt or Hamburg. Its grungy, slight down at heel neighbourhoods, with their lower rents and younger populations are becoming hubs for the new start-up capital of Europe. Berliners argue that post-Brexit, cheap Berlin will win business from expensive London, because an isolated UK, where talented European immigrants might need visas, will not provide the creative infrastructure attractive to start-ups. If the UK crashes out of the EU without a deal, this notion will become more not less likely. However, history indicates that it is difficult to predict how big geo-political shifts will pan out economically. For example, years ago, the prevailing wisdom was that when the wall came down, the central and eastern European economies would blossom under German tutelage. The Euro project was cobbled together by France to ensure that a united Germany would be anchored in western Europe rather than drifting to the east. So much of German history has been a battle between the Prussian, mainly Protestant eastern part positioning Germany to look east and the southern and western parts of Germany, the old Holy Roman Empire, mainly Catholic parts, positioning Germany in western Europe. Unification was deemed to be the signal for Germany to shift to the east and, in the process, lift the eastern countries up. The supposition was that this German pivot would enrich the countries east of the Elbe, to the implicit detriment of the countries in the west. However, when you look at the data what emerges is an unusual picture. The country in Europe that has done best economically since German unification is Ireland. No one predicted that. At the time the rational bets were being placed on the old Czechoslovakia, Hungary or Poland. But it was Ireland, the perennial economic underperformer that benefitted most from German unity. This is because when the wall fell, the twin forces of democracy and globalisation under American global hegemony replaced communism and trade barriers policed by the two superpowers, the Yanks and the Soviets. Ireland, although we didn’t know it at the time, was positioned perfectly to become a trading entrepot, taking full advantage of American capital investment, open markets and talented European immigration. The corporate tax helped, but access to this market was also critical. In addition, being open to the type of people who wanted to leave central Europe to make their lives somewhere else, implied that the Irish labour market was no longer limited to the four million odd of Irish talent, but was expanded to the best of 450 million people. Interestingly, American capital didn’t have to invest in eastern Europe to get access to eastern and central European markets . It could locate in Ireland and do the job from here. Culturally, Ireland is much closer to the US for American executives than, let’s say, Slovakia or Hungary. Thus we offered corporate America the best of both worlds: a tax-efficient, European foothold that looks and feels like New England. Corporate America responded with a surge of capital investment into Ireland rather than anywhere else. Since the wall came down, American companies have invested more in Ireland than in China, India, Russia and Brazil. Ireland from 1989 to 2018 has become to Europe what Shanghai was to China from 1880 to 1945: a free-trading outpost with full access to the huge internal market, without having to actually set up there. Ireland was/is the launch pad for America into continental Europe. This has made us immeasurably richer than the up-and-coming central Europeans who got German products without German investment driving their own industries to the wall, while Ireland that had precious few domestic industries previously, got an entirely new capital base. Here in Berlin in 1989, when Helmut Kohl spoke of blooming landscapes in the East, no one imagined that the greatest beneficiary economically from the end of the cold war, would be a windswept rock in the Atlantic as far away from central Europe as it is possible to be while still being in the continent. Now with Brexit, the UK is providing us with another opportunity to reinforce the impression of an open, free-trading, welcoming, savvy country unencumbered by the self-deluding, nationalist myth of specialness. Brexit is an act of aggression against globalisation. Investors won’t forget that. In addition, the way things are going, the UK may well end up very soon with a new government whose economic policies are more East Germany than west Europe, with an extreme leftist ideologue in power. In fact, Corbyn’s manifesto implies that a Labour government in London would be the most left-wing government in Europe since Eric Hoeneker’s regime in Berlin were boarding up subway stations. Such an outcome will prompt mass capital flight. Where do you think lots of that capital will come? Here of course. Compared to the UK, Ireland looks like an oasis of sanity. As such, Brexit provides Ireland with an unsurpassed commercial opportunity, and we should seize it with both hands. If we don’t, someone else will. Agree with you on the dangers of Corbyn – lets hope that doesnt happen. There’s no doubt that Ireland will have opportunities post Brexit in many industries though in agriculture and food there is now a huge incentive to move all processing and production to Northern Ireland. Despite all the so called American and foreign investment in Ireland since 1991, average workers wages has continuously gone down in real terms. Workers are working longer hours under worse conditions for less buying power. The influx of eastern European workers has and is benefiting the owners of big capital while driving down the wages of those Irish workers who have to compete with or are displaced with them. The extra demand for housing, health services etc has left Paddy in a longer queue. I agree that Brexit could be Ireland’s opportunity but my concern is that we lack the infrastructure right now in terms of housing, transport, schools etc to support incoming large scale companies unless some speedy radical solutions are provided by government. Such an outcome will prompt mass capital flight. Where do you think lots of that capital will come? Here of course. Compared to the UK, Ireland looks like an oasis of sanity. London Bullion Market deserves to lose bullion market as the criminal enterprise is gradually exposed. The question is //would Dublin operate an ethic enterprise that could be trusted. Being positive now is to anticipate the coming recession. Be Prepared. QE pumped in 14 Trillion to avert the last crash being a wipe out and recently the cash flow has come to a trickle as central banks try to rebalance their ledgers. It is now the time for the exchange of the ‘seigneur des anneaux’ between the Kingdom of Kerry with Windsor and reclaim the magical powers of our own primal intuition. => DO YOU THINK BREXIT COULD BE LEFT TO CHANCE? Sovereign money for a sovereign nation. Money that has no counterparty risk. Money that is not an IOU. Money that is not a debt. Money that has stood the test of time. Honest money rather than dishonest paper script worth in reality nothing at all.